In 1962, a barber from Jalisco, Mexico came to California and would eventually work with some of the pioneers of the Napa Valley winegrowing business. Salvador Renteria, along with his wife, Luisa, would build one of the most important vineyard management companies in the area, becoming a farming force at a pivotal time in Napa Valley history. While working on projects at Sterling, Dalla Valle, Screaming Eagle and many others, the family became more and more dedicated to meticulous vineyard practices. Their son, Oscar Renteria would continue the family mission, focusing on distinguished vineyard clients while bringing innovations to farming practices and the well-being of farm workers. After decades of continuous improvements, Renteria Vineyard Management became a leader in the industry. After 40 years of working vines for others, Oscar was proud to claim the deed to the family’s first estate vineyards. To complete the circle, the best grapes of these vineyards are curated and hand-selected to make small batches of premium wine. But what to call these precious wines? Many names were discussed while sitting around the dinner table. Now a grandfather, Salvador said “Tres Perlas of course”, his name for the three granddaughters, the future of the family. Spanish for three pearls these wines are thoughtfully crafted with the next generation in mind. Oscar likes to think ahead. He’s constantly thinking of how to implement new vineyard technologies across Napa Valley, improve the way of life for his vineyard workers, and discover new ways to celebrate with his family. His vision, energy, and imagination are what draw people to him. Denise brings balance to Oscar, their familia, and Tres Perlas. Together they expanded their Vineyard Management company and continue to raise their three daughters, Bella, Mia and Gabriella, the inspiration behind Tres Perlas. It is Denise’s incredible style and warmth that drive the feeling of our brand. Salvador came to the valley equipped with an innate ability to bring people together and guide vineyards towards higher quality. This earned him the attention and respect of famed vintners like Andre Tchelistcheff, Rick Forman, Mike Walsch and many others. 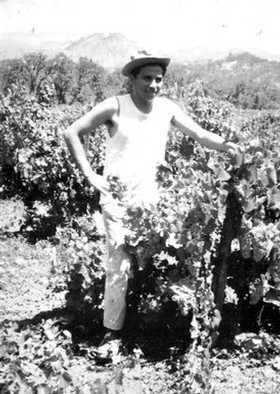 These pioneers saw that Sal’s dedication to the details, and his Hispanic heritage, allowed him to bridge gaps between winemakers and vineyard workers. First as a field laborer, then as a supervisor and manager, Sal would become an indispensable leader within his company and eventually oversee large growing regions across the valley. In 1987 Salvador began Renteria Vineyard Management, one of the first Mexican-owned farming companies in Napa Valley. Along with his son Oscar, they continue a tradition of meticulous farming, loyal relationships and stewardship. Remarkable things can happen when farmer and winemaker speak the same language. Kirk and Oscar can spend hours in the vineyard poring over the details of quality winegrowing. Growing up in Rutherford and surrounded some of the world’s best vines, some of Kirk’s first memories were the heat of harvest, the cool smell of a wine cellar, and scouting Cabernet Sauvignon vineyards with his "understanding a specific vineyard and the hidden potential of a site is imperative to the optimizing the quality of wine that can be made." Long before he earned a degree at University of California, Davis, winemaking had been central to Kirk’s life. After returning home, he developed Venge Vineyards alongside his father Nils, a winemaking pioneer and icon in his own right. A little magic makes all the difference. Dedicated to service, wine, and hospitality, Harry oversees the experience of our Members as well as familia and friends of Tres Perlas. Following a former life at Disneyland, Harry found his way to the valley and served as a Concierge for luxury resorts. After earning accolades as a Concierge for creating luxury wine experiences, he pursued his passion for wine and is studying with the Court of Master Sommeliers focusing on authentic family-owned producers. Harry shares the Renteria story with the same dedication to culture, quality and spirit as the family.